Answers to your rose questions! Answers to your rose growing related questions are provided by our Rosarians with additional supporting information provided by many reliable resources. Have A Question About Roses? Q. When do I fertilize my roses? The first fertilizer treatment should be in April right after spring pruning. Q. When is the best time to plant roses? ​The best time to plant roses in the Kansas City area is in the spring. Bare root roses can be planted in March, as soon as the soil is thawed. Potted roses can be planted from April-June. You can plant potted roses in August. but they should be hardy shrub roses on their own root system so they can get established before winter. Q. What is the difference between own root and grafted roses? The difference is in the structure of the plant. Own root roses are a single plant growing on its natural root system. 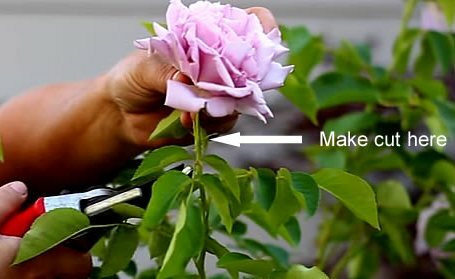 Grafted roses are actually two different plants that have been spliced (grafted) together. ​Q. How deep do I plant grafted roses? In the mid-western region, you should plant the graft 2-3 inches BELOW the soil level. This means you will plant it deeper than what you see in the nursery pot you bought it in. Planting it below soil level protects it from our area’s wild temperature swings in winter and spring. Q. When is the best time to transplant a rose from one part of the garden to another? The best time to dig and move a rose is when it is dormant. This means that all the leaves have fallen off for the winter. Prepare the soil where you want to relocate the rose in the fall. It is usually too wet in the spring. ​Q. When should I prune my roses? Q. How do I prune my rose bush? Remove any canes that are growing through the center of the bush. -- The goal is to have an open center, like a vase, with canes around the edges all pointing outwards. Q. What is the biggest pruning mistake? The biggest mistake is not pruning the bush back hard enough! Roses bloom on the current season’s wood, so hard pruning is beneficial. It is okay to cut most roses back to 12-18 in. The reward will be a lovely landscape plant with lots of new growth and lots of flowers. Here are two documents from the American Rose Society with further details on pruning. Q. Do I need to deadhead roses? Here is a document from the American Rose Society about deadheading. Cut above the first set of 5-leaflets. Q. 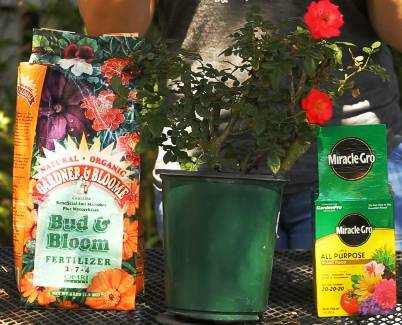 When should I stop deadheading in the fall? Stop deadheading at the end of August so the plants can begin to go dormant for winter. Q. My roses had a tough winter and look almost dead. There is only signs of life and new leaves emerging at the very base of the plant. How can I save it? Roses can tolerate very hard pruning in the spring after a hard winter. Cut off all the stems down to where you see new growth. You will be rewarded with new growth and flowers about 6 weeks after pruning. Q. How do I water my roses? Roses need more water than many garden plants to keep them healthy and blooming all summer. Hold your favorite watering wand over a 5 gal. bucket and time how long it takes to fill it up. 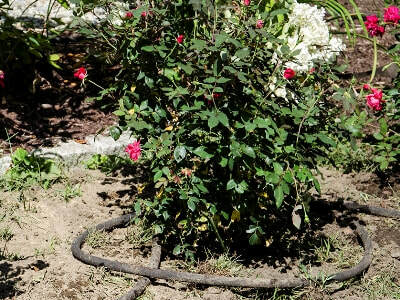 This is how long you should water each rose bush. If you use an overhead sprinkler, water in the early morning so the leaves will dry quickly (to prevent fungus disease) and water deeply and infrequently so that the leaves are not constantly damp. Q. How do you tell the difference between weed killer leaf damage and rose rosette disease symptoms? Weed killers can cause distorted growth, but it is different from the symptoms of rose rosette disease. Damage from 2,4-D or other lawn herbicides appears as skinny, pale green, twisted or distorted leaves. The leaves or stems will eventually turn brown and die. If the damage is bad enough, the whole plant will rapidly decline and die. The leaves of roses with rosette disease are bright red, the stems are very thorny and grow in bunches called “witches broom.” The plant can show symptoms for many years and will gradually decline. ​If you are not sure, cut off the affected stems and wait to see new growth. If the damage was from herbicides, the new growth should look normal because the spray damage was a one-time event. 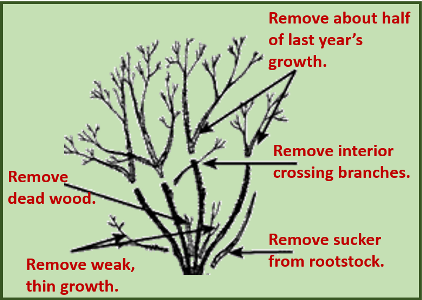 If it is rose rosette disease, new growth will have the same red, excessively thorny, witches broom growth. Or, the plant will grow new stems from other parts of the bush that show the red, distorted, thorny growth. Above: Herbicide / weed killer damage. Coffee grounds just add some organic matter to the soil, they can not affect the color of your roses! What happened is that your rose was a grafted plant, with the Hot Cocoa plant on top, grafted to a different rose on the bottom for a stronger root stock. The bottom plant is called Dr. Huey, and it is a dark red climbing rose that is not very pretty on its own, but makes good root stock. Over this past, nasty winter, the Hot Cocoa part died. So what you are seeing is the Dr. Huey part taking over. Unless you love it, you should dig it up and start over with a new Hot Cocoa or rose of your choice. This time when you plant it, be sure that the grafted part (a thick knob with green sprouts on the top and a short stalk with roots at the bottom) is planted three inches BELOW the soil level. This will protect it from winter damage. This page, Getting Started, on our website, describes how to plant a grafted rose. Q. Help! Something is eating my rose leaves. They eat the green part but leave the brown veins behind. It looks like stained glass windows. Or, sometimes there are big holes chewed out of the leaves between the veins. This damage is caused by rose slugs. Little green larvae of the sawfly. They like the tender green tissue but can't chew the tougher veins. Learn more by visiting this page, Rose Insect Pests, on our website; see the rose slug section.